Northstar’s new Midcentury Metro collection brings the understated styling of the 30’s, 40’s, 50’s and 60’s to Elmira’s Northstar line of appliances. With less chrome and simpler lines than Northstar’s Designer Classics, the Midcentury Modern line reflects the minimalistic design aesthetic of the midcentury modern era – the perfect choice for any retro, midcentury or modern kitchen! 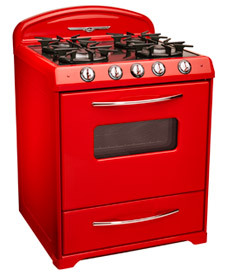 Choose from all-electric, dual fuel, or all-gas ranges. Add a refrigerator, and choose from Northstar’s microwaves, dishwashers, range hoods and backsplashes to complete your vintage kitchen! 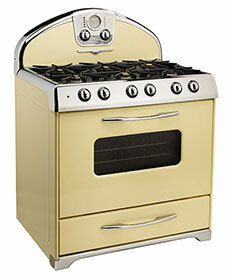 Now, a professional 36″ 6-burner dual-fuel range that combines state-of-the art performance, convenience and features with Northstar’s signature vintage-inspired lines and colors. Chilling! 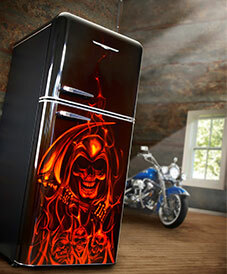 Our Model 1952 fridge is now available with skulls-and-flames custom airbrushing. Amazing detail, “orange candy” paint, and multiple layers of clear coat create a three dimensional effect that virtually “catches fire” as you throw light on the fridge! Perfect for entertaining and bar areas. 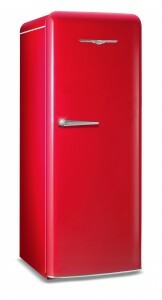 The single-door Model 1949 fridge provides 11 cubic feet of beverage and fresh food storage behind a single door. Also available with the Northstar BrewMaster draft beer keg system.